I am a red onion lover and, in my world, there may be nothing better than having a cupboard full of red onion opportunities. The pickled onion is one of my very favorite kitchen projects. I get the benefit of the onion, including all of the antioxidants that onions have to offer, and I get the bonus of the apple cider vinegar. My cupboard is literally filled with multiple flavor variations of this onion. I use the onion slices in salads and simply wherever the need strikes me. I use the vinegar in salad dressings and vinegar shots. I love the diversity of flavors this project brings. I post some of my favorite flavors on this website at various times but they all follow the same formula: I add whatever herbs, spices, and fruits strike my fancy. I combine them with sliced red onion. I pour apple cider vinegar over it and let it sit for a few weeks or longer. It simply does not have to be more complicated than that. 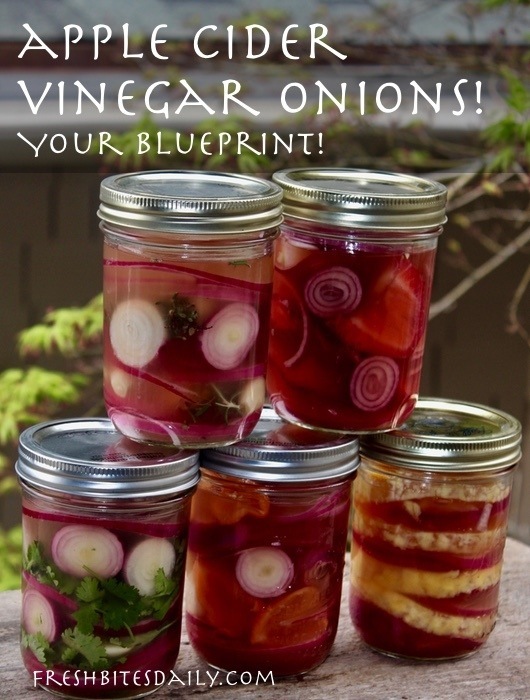 The onions and the added seasonings all end up pickled and can get used in your kitchen creations. Of course, in the process, the apple cider vinegar itself becomes a gourmet mastery. If you have not tried this concept, you owe it to yourself to do so. This is a recipe where over-ripe fruit shines — the fruit that may be past its peak for eating raw and yet it has not spoiled. Add it. Don’t add spoiled fruit. Ewwww. Add garlic, ginger, pepper, and any spices you desire. For the most part, a ground up spice will be better than whole, but fresh ground is important too. If it’s been in your cupboard for seventeen years, you won’t get a lot of flavor out of it. Fresh herbs and spices are wonderful too. I would give them a “rough chop” before adding them, just to increase the surface area and release the flavors a bit more. Store these in a pantry for a couple of weeks or keep them for a couple of months. As for shelf-stability, I don’t think mine have stayed around longer than about three months so I am not sure how long they will last. If the vinegar covers all of the added foods, it will likely last for some months. However, if mold develops or if they smell “off,” definitely discard them.